The waves were rolling in low and slow, and the sun was bright this Wednesday for Day 5 of the 2018 Vans U.S. Open of Surfing in Huntington Beach, CA. The event, which includes surfing, skateboarding, and BMX, is one of the largest action sports festivals in the world. Local heroes, the Gudauskas brothers, are fan favorites from nearby San Clemente, CA. Patrick and little brother Tanner both held their own in the contest so far, winning their heats and advancing to the next round. The Men’s World Surf League (WSL) Qualifying Series 10,000 contest allows competitors to make the Championship Tour and compete for the WSL World Championship. Surfing heats are made up of four surfers—the top two in each heat advance to the next round. Surfers are judged on speed, power, and flow. Due to the small waves in Huntington Beach this week, judges will also be looking for airs. Five judges will score a surfer’s ride on each wave. The top two wave scores together comprise the total score for a surfer. The competition continues through Sunday. The Gudauskas brothers are not just racking up the points on the boards. They are also introducing kids to surfing and the ocean. Through “Positive Vibe Warriors," a foundation started by Dane (Patrick’s twin brother), Patrick, and Tanner, the three brothers raise money to assist communities with youth water safety programs and to encourage emerging surf nations to get involved in the ocean in a positive way. “We have the opportunity to help others who maybe don’t have the same opportunities,” Patrick says. “That’s what is keeping us inspired.” Through the foundation, the brothers have also held surfboard drives with boards going to Jamaica, South Africa, and, soon, Trinidad and Tobago. The brothers also host a youth surfing celebration called “Stoke-O-Rama.” Each event raises about $10,000 dollars, which is given to youth water safety organizations like Junior Life Guards. The 2018 Vans US Open of Surfing is about more than just surfing, though, with the premier competition in park terrain skateboarding for men and women. The Vans Park Series (VPS) Pro Tour, now in its third year, arrived in Surf City Huntington Beach for the third qualifying stop on the 2018 VPS Pro Tour. Each skater gets four runs of 45 seconds. A panel of judges, looking for speed, flow, air, and tricks, gives each run a score up to 100 points. Only the score from the best of the four runs counts on the leader board. The women’s defending champion at this event and 2017 X Games champion, Brighton Zeuner, is returning to defend her title. 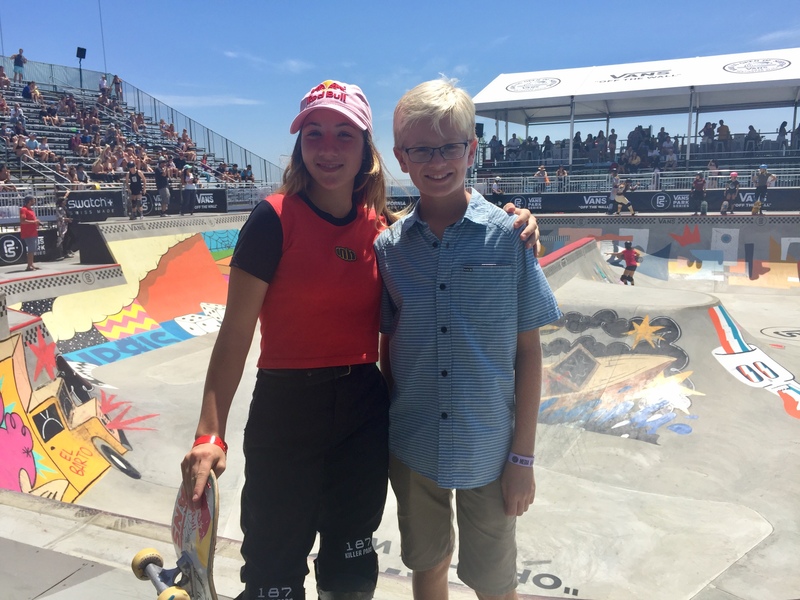 Off the board, Zeuner is focusing on helping other girls skate. The US Open of Surfing is about champions—both on and off the board.